Members of the Sikkim Progressive Youth Forum (SPYF) undertook a 123-km ‘Chalo Gangtok’ foot march from Gyalshing in West Sikkim, and reached the state capital Gangtok last Thursday. SPYF members have been demanding proper medical facilities at the Gyalshing hospital. A Groundxero report. Hundreds of young people from west Sikkim participated in a 123-km ‘Chalo Gangtok’ foot march from Gyalshing (or Geyzing) in West Sikkim to Gangtok, starting from 20th January. Sikkim Progressive Youth Forum (SPYF), which called for this march, is a platform organisation consisting of students from Universities, colleges and schools. The marchers reached Gangtok on 24th January and are currently camping in the District Court premises in Sichey. 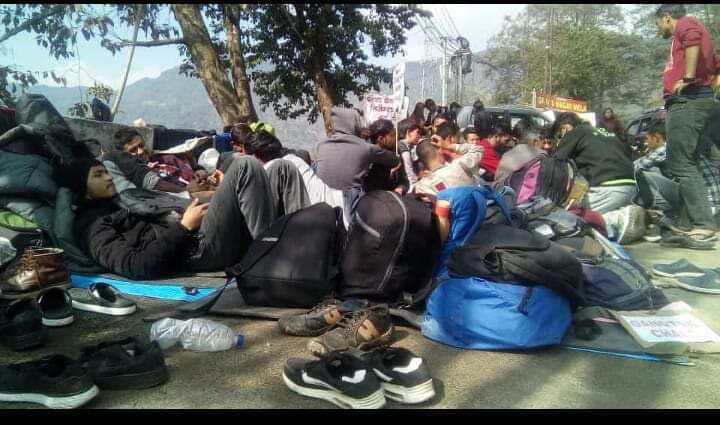 This was after Sikkim Police denied permission for the protestors to camp at the Titanic Park, where they had initially assembled. On last Thursday the protestors shifted to the court premises. Six days have passed since they began the march demanding proper medical facilities at the Gyalshing hospital. Their ‘dharna’ in Gangtok entered its third day on Friday. They are continuing with their sit-in protest in this chilling cold, and several of them are falling ill but are still determined to force the government to implement their just demands. Members of SPYF camping at Titanic Park, Gangtok. 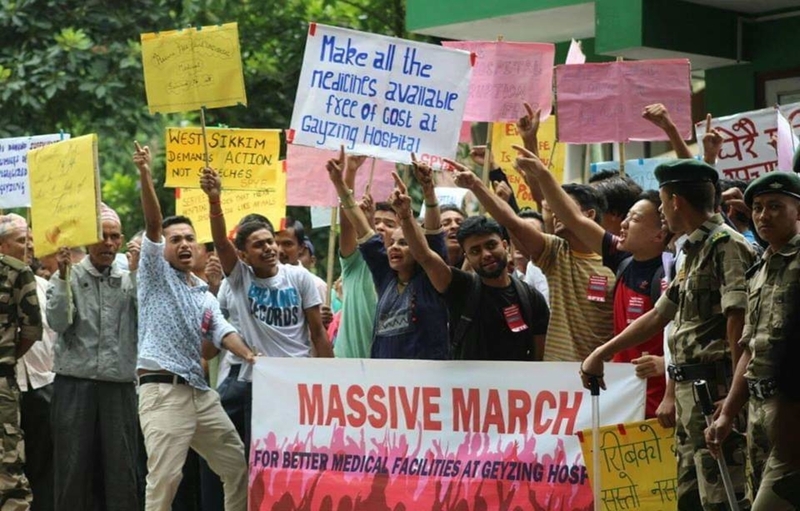 The call for ‘Chalo Gangtok’ was to protest the state government’s inaction, despite the health minister’s written assurance regarding upgrading facilities at Gyalshing and other district hospitals to bring them in line with the India Public Health Standards (IPHS) requirements. SPYF alleged that the government did not even fulfill 50% of the requirements of the Indian Public Health Standards (IPHS). In December and January of the year 2017-18, SPYF had carried out a signature campaign in West Sikkim to demand for better medical facilities at District Hospital Gyalshing. Thousands of signatures were collected from people belonging to different sections of the society. In February 2018, the memorandum with the signatures was handed over to the Chief Minister of Sikkim, Shri Pawan Kumar Chamling. The CM gave a verbal assurance of fulfilling all the demands raised by the forum, at the earliest. 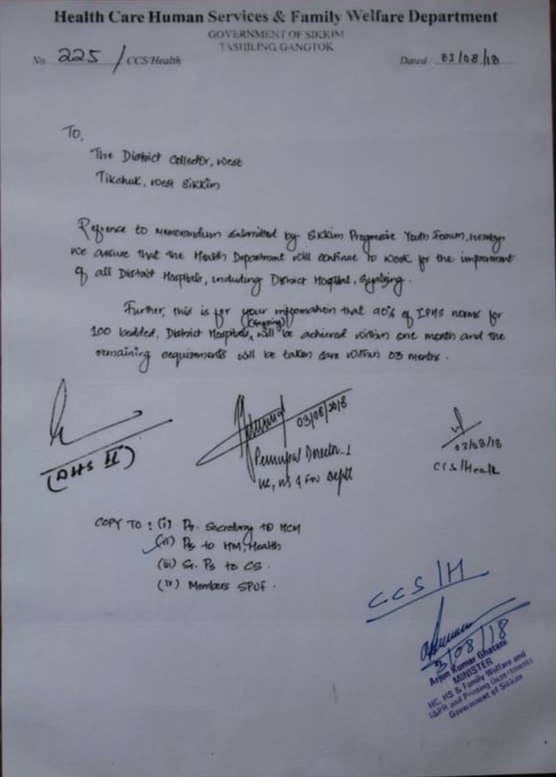 A copy of the same signed memorandum was also submitted to the state Health Minister Shri AK Ghatani, Health Secretary of Government of Sikkim, the District Collector of West Sikkim, and the chief medical officer of District Gyalshing Hospital. Six months passed after the submission of the memorandum but no concrete action was initiated. The condition of the Gaylshing hospital remained unchanged. SPYF visited the health secretariat several times, only to receive hollow assurances. Then on 28th of July 2018, around 1500 people participated in a protest march to Gyalshing Bazar. People from all the surrounding villages joined in large number. On the same day, the participants of the march signed another memorandum. A few days later, the young members of SPYF went to submit the memorandum to the Health Minister. The forum members who went to meet the health minister insisted that he give them a written assurance that all their demands would be accepted within a specified dateline. The minister did not agree to give any written assurance. The demonstrators peacefully assembled there and waited for him to address them. The minister called in the police, who asked the demonstrators to disperse. When they refused, the police proceeded to forcefully evict them. The police dragged the demonstrators, including women, and threw them out of the gate. The SPYF decided to stage the protest outside until the minister provided the written assurance. The ‘dharna’ went on throughout the night, at the road outside the health office. After 23 hours, the minister and the top bureaucrats of the health department appeared and agreed to the forum’s demands unconditionally. On 3rd August the health minister and bureaucrats gave a written assurance where it was explicitly mentioned that 90% of the IPHS norms for a 100 bed district hospital, would be implemented in Gyalshing District Hospital within 1 month from the date of signing. The remaining requirements will be taken care of within 3 months. In addition, it was also mentioned that the government will work towards changing the condition of other public hospitals of the state as well. Even after the completion of 3 months, few specialists and nurses were appointed. The forum alleges that the minor makeovers done, do not even lead to 50% implementation of IPHS provisions. The most basic health services like ultra-sonography are still unavailable; the ICU is not operative in the hospital. However the Health director, Pempa T. Bhutia claimed that except radiologists and few surgeons other services are now available. He pointed out that even after repeated advertisements no application was received for the post of Radiologist at the hospital. Speaking about absence of blood banks in the hospital he mentioned that in an 100 bed hospital, blood bank is ‘desirable’ but not a ‘necessity’ as per IPHS norm, and he further informed that a blood bank is being constructed. The SPYF demands the state government ensure complete implementation of all ‘necessary’ and ‘desirable’ infrastructural requirements under the IPHS norms. Some of the protestors also mentioned that claims made by officials are false and the Gyalshing Hospital still remain in shambles. The protestors singing at the dharna site. 1 STATUS OF HEALTH IN SIKKIM: ISSUES AND CHALLENGES by Karma Loday Tamang, Sandhya Devi Thapa, Bhuwan Chhetri.